Meeting to decide the fate of bighorn sheep on public lands. There will be a meeting in Boise on Thursday to discuss formation of a policy which will more likely try to save sheep operators rather than the remaining bighorn sheep in Idaho. The interim policy calls for killing bighorn sheep that come into direct contact with domestic sheep but sheepherders want more. I encourage anyone who might be interested to attend this meeting. Hello everyone. Here is a draft agenda for the upcoming February 26, 2009 Idaho Bighorn Sheep (BHS) / Domestic Sheep (DS) Advisory Group meeting. — How do you define collaboration? — What are you hoping the Idaho BHS/DS Advisory Group process can achieve — and in what time frame? — What group guidelines and/or principles would help the BHS/DS Advisory Group to be most effective? — What do you need from other participants in this process? — What would you need to see in order to consider this a legitimate and worthwhile process? — What do you think the outcomes of the process should be e.g., consensus recommendations; unanimous with one, two or three dissenters; majority/minority recommendations, or another approach? I found it odd that this and the next three meetings are all largely process: group conduct, charter development, identifying issues, goals etc. And there will be twelve to eighteen to follow! Everyone knows that it’s to be a collaborative effort to develop recommendations for managing bighorn and domestic sheep interactions. The goals were discussed in September. I wonder why they jsut don’t get to it. Perhaps given that the PNF plan is being appealed and other possible litigation, a year or two for something to shake out from this group could still be relevant and of value. They’re responding to the literature on what factors lead to successful collaborative efforts. A recent meta-analysis of the Forest Service’s collaborative efforts found that several “process” related factors had positive impacts on collaborative efforts, such as, (a) effective facilitators, (b) focused scope and realistic objectives, (c) comprehensive and sustained process, and (d) equitable distribution of power and influence (among others). Similarly, the same analysis found that participant traits such as (a) trust and social capital among participants, (b) continuity of participation, (c) strong leadership, (d) support and participation by agency staff, etc., also impacted the success of collaborative efforts. Looks to me like the facilitators they’ve brought in are being thorough. Note: Not trying to get caught up in a “to collaborate or not to collaborate” debate again, just relaying possible motivations for the questions posed by the facilitators. cite: Leach, W.D. (2006). Public Involvement in USDA Forest Service Policymaking: A Literature Review, Journal of Forestry, January/Feb. p. 43-49. Group is advisory no regulatory or legal authority. 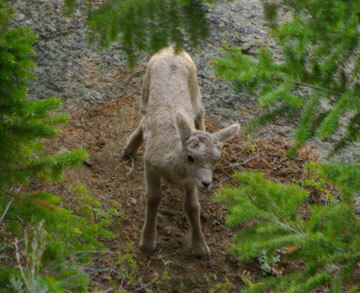 Idaho wants bighorn sheep and domestic sheep. Group is collaborative. Will develop collaborative recommendations & Products. At this point, with bighorn sheep declining at a rate where there has been a 70% reduction over the last 25 years and populations still declining, I don’t see how the two can co-exist. While I have an agenda and place saving bighorn sheep at a higher priority than saving the domestic sheep industry, I am struggling to see how an industry, that depends so highly on government subsidies and the government created market that the for their products by buying wool and meat for various purposes like military blankets and such, can survive and still maintain a separation between the two. They depend on public lands for their survival. That can be said for both bhs and ds. But can they both co-exist on public lands? Realistically, I seriously doubt it. Idaho is unique in that it has a lot of topography that supports bighorn dispersal across long distances. This means that if one animal gets infected with disease it can interact with sheep across a large area and then the disease becomes endemic in the population and takes a long time to go away. That is the only advantage of having isolated populations like Nevada and a few other places but there are also disadvantages like low genetic viability and lack of exchange. Take away my desire to rid public lands of livestock, how do you accomplish the stated goal of maintaining viability of both bhs and ds? I don’t think it can be done unless you severely limit where domestic sheep can go, keep moving them back from areas where bighorn sheep show up, and provide areas where domestic sheep can graze. But where are those places? They don’t exist because either they have other permitees or they are incompatible in some other way for sheep grazing. When you factor in other values the problem becomes even more difficult. If I were in the sheep business I would be supporting the buyout legislation right about now and looking for another line of work like other people are trying to do. They wouldn’t be alone in that regard.